Most of you probably remember that I splurged on a number of Burberry items last month, right before I came back from California. I waited for quite a while before I finally broke out the products and used them, and boy do I wish I had taken them out sooner! 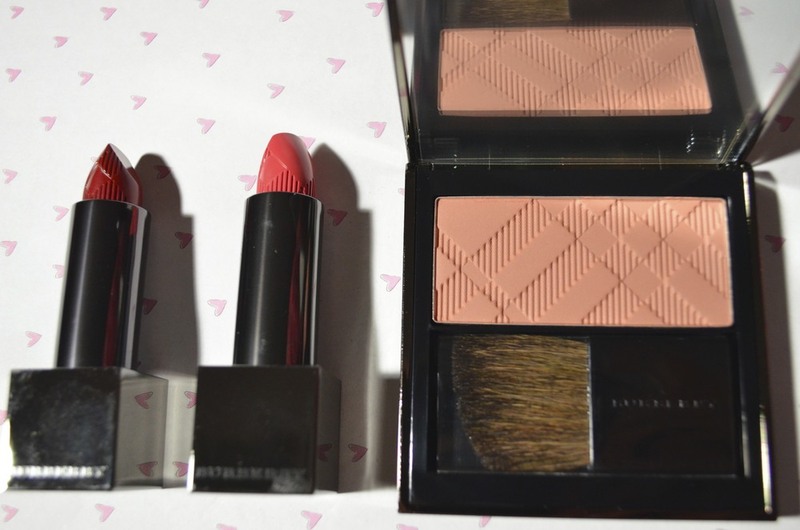 Here's a closer look at the Burberry Lip Covers (Hibiscus, Primrose Hill Pink) and the Light Glow Blush (Tangerine). Isn't that Burberry check pretty?? The lipsticks themselves do have a scent reminiscent of old school lipsticks. I don't mind it, most of the time, but I would love it if there wasn't a scent or it was something else all together. I really enjoy the lipstick formula, however. My lips are quite dry most of the time, and often get worse throughout the course of the day. With these lipsticks on, my lips can maintain what moisture they have, which really says something! Hibiscus is my first red (!!) and does have a bit of pink undertone to it. Primrose Hill Pink is a bit of a coral-y pink on me, and it is quite pretty. Both lipsticks wore easily 3-4 hours before they faded, but they both faded quite evenly so that the color was still wearable and I wasn't bothered to reapply. Since only some intense meals got in the way, I imagine someone who doesn't eat as often (or messily) as I do would have better luck! I also purchased 2 eyeshadows, Dark Sable and Antique Rose, and received Pale Rose as part of a gift with purchase. I always wanted to buy a Burberry eyeshadow, but never really knew what color to go with. I was also puzzled, since every time I swatched one at a counter, it somehow didn't seem as impressive or amazing as everyone said. I've now realized that these eyeshadows are meant to be very muted and natural looking, so that when you wear them, it doesn't necessarily look like you're wearing eye shadow, and that is why swatching them just simply does not do them justice! Really, so many of these shades have a remarkable effect on the eyes! I was really interested in Dark Sable, as it seemed like the perfect neutral liner shade, and it definitely has been! It offers a really natural emphasis, so it doesn't LOOK like you're wearing eyeliner but still offers that level of definition. Lining aside, Dark Sable is also a great eyeshadow shade overall! My boyfriend actually pointed out Antique Rose at the counter, and I was surprised to like it! I've always been scared of eyeshadows with any red or pink to them, but Antique Rose and Dark Sable together create really nice dimension on the eye. I was happy to get Pale Rose as well, but found this to be less pigmented than the others. It does make a decent highlight shade and adds dimension to the previous two shades. Here's one look, where I wear Tangerine, all 3 eyeshadows, and Hibiscus Lip Cover. Note that this photo was taken 4 HOURS after application! Here's another look, this time wearing Primrose Hill Pink Lip Cover, Dark Sable & Antique Rose, and Tangerine blush. I definitely have more eyeshadows on my list (Pale Barley, Almond, and Midnight Brown) and I'm definitely contemplating more lip products and foundation. If you're a Burberry fan, I'd love to hear about your favorites!